Successful political communication is, amongst other things, based on dialogue with people and on actions with impressive and clear pictures that offer an unconventional way of attracting the interest of the press and the public. This was the approach that guided our Green actions in the street in four election campaigns between June 2009 and June 2010 (European Parliament election, local election, German federal election and election of the state parliament) over the space of twelve months in the German state of North Rhine-Westphalia. Of course, all our offline street actions were edited for the online Green election campaign and supplemented with additional online activities. The advantage of the Greens, in comparison to other established political parties, is that their Green actions can have a ‘hand-made’ appearance and need not always look like up-market glossy products. They do not have to conform to etiquette. Stage tour with well-known Green politicians. At important places in city centres, leading Green politicians were interviewed on the stage of a Green-branded truck. The audience also had the chance to ask questions. You can see photos here. Climate change tour with a polar bear. 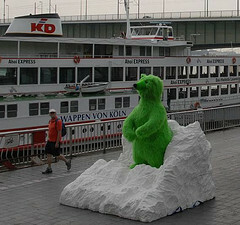 A Green life-size soft toy polar bear placed on an imitation iceberg proved a good eye-catcher and at the same time a good lead to an information desk about climate change.The polar bear was also a popular photo subject for passers-by. Coffee vehicle. With a van transformed into a coffee vehicle, we visited market squares and city centres offering citizens Green-branded cups of fair-trade and organic coffee for free. The people stopped to drink their coffee, providing the chance to start many conversations. Even without a coffee vehicle, a drinks dispenser can be easily organised. Mobile bus stop. To illustrate the Green topic ‘buses and railways’, we travelled around with a full-scale bus stop that also served as a Green information desk. 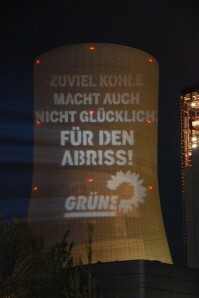 From a distance of 300 metres, we projected an anti-coal slogan onto the cooling tower of a coal-fired power-station that was under construction. You can see videos and more photos here. On April Fools’ Day we set up a construction sign for a new nuclear power station in a field close to the state capital Düsseldorf. You can see videos and photos here. Pictures and videos of the actions described above can be found at http://www.gruene-nrw.de/.